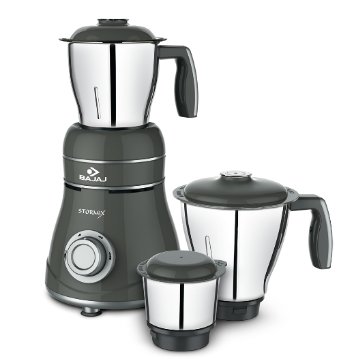 Bajaj Electricals Ltd., India’s leading consumer durable and lighting company, launched a range of four new Mixer Grinders in Bangalore City today - Bajaj Stormix, Bajaj Twister Dlx, Bajaj Twister Fruity & Bajaj Hexagrind. These powerful mixer grinders are designed keeping in mind the changing consumer needs with respect to more convenience features that also compliment the aesthetics of the modern kitchen. Some of these products were recently introduced in select markets, but this is the 1st appearance of these 4 Mixers in the South Zone. As per market studies, South Zone holds an importance in the MG segment, as over 40% of MG sales happen in South zone. The consumer needs in the South markets are very different due to the difference in cuisine. Within the South markets, Karnataka is the strongest turf for Bajaj Electricals for Mixer Grinders. This was our 1st step in entering the South market with a completely new range of product offering suiting consumer requirements – Bajaj Twister Dlx, Bajaj Twister Fruity, Bajaj Hexagrind & the Bajaj Stormix Mixer Grinders. Stormix has not been introduced in any other market so far and made its debut in Bangalore. With this launch, Bajaj Electricals aims to delight the consumers’ experience in the kitchen during food preparation and also add vibrancy to the kitchen décor. The launch marks the beginning of a series of new product launches to follow. Over the next 3 years Bajaj Electricals aims to move its market share from the current 21% to 26% with an additional 5% coming through launch of new products meeting consumer needs. All the four new mixer grinders have a 100% copper motor for higher product life. The blades are super fine high-grade stainless steel thereby ensuring a good output and a longer product life. The jars have Tetra Flow technology for better ingredient mixing. The product also comes with a 2-year warranty and a 5 year warranty on the motor.